If you actually read McLuhan's books, you're in for a treat. They're very possibly some of the most creative and visionary works published in the 20th century. Yes some of them experiment with form and style and are full of pictures drawn from advertising and popular culture, and thus seem a bit lightweight and weird, but that was him genuinely experimenting with boundaries that had been rigidly defended in academe for centuries. And plenty of his work, and all of the best stuff, is just plain text. The more I read McLuhan a few years ago, the more it occurred to me just how ahead of his time he was. Another reason he wasn't fully appreciated when he was actually writing. Very few thinkers really stretch the boundaries of the contemporary thinking of their day, it's nearly always a variation on a current theme. 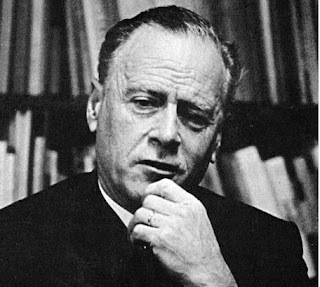 McLuhan was one of those thinkers who went so far beyond the concerns of his own day that many simply didn't see the importance of what he was doing. I want to talk about some of his amazing ideas, in the next post. Including his ideas about cliches, which he saw as absolutely fundamental, rather than heaping scorn upon them like most of the rest of the literary establishment.